Assemblyman Todd Gloria’s legislative effort to prevent a replay of San Diego’s sluggish response to a deadly hepatitis A outbreak is facing unexpected backlash from vaccine opponents who say the measure could compel vaccinations. Gloria’s office reports it has recently received dozens of daily calls from anti-vaccination activists who fear the bill could give health officials the authority to order immunizations. AB 262, introduced by Gloria and Assemblywoman Lorena Gonzalez, doesn’t actually mention vaccinations. It aims to clarify public health officers’ responsibilities during outbreaks, including their ability to issue directives to other governments to take action during health scares. 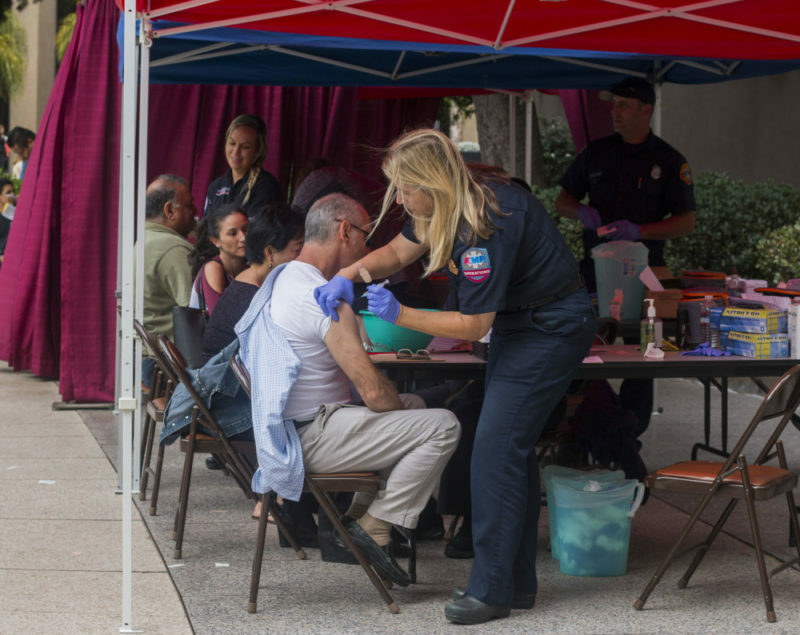 San Diego County officials took months to issue a directive to city officials as the hepatitis A outbreak escalated in 2017, and state auditors highlighted the impact of those delays in a devastating December audit that inspired AB 262. Denise Marie, who would not share her last name with Voice of San Diego, has since organized a group to rally against AB 262 at the state Capitol on March 19, when the state Assembly’s health committee is set to review the bill. Gloria spokesman Nick Serrano acknowledged the pushback caught the assemblyman’s team off guard. He said they were focused on the deadly San Diego outbreak and state auditors’ recommendations that the legislators address confusion that may have contributed to the stalled response – not on immunizations. But in the days and initial weeks after it was introduced, AB 262 was included on social media-distributed lists of bills across the country that anti-vaccination groups consider concerning. Late last month, the resistance against AB 262 spiked. Stefanie Fetzer of Orange County, who runs two Parents United 4 Kids groups on Facebook, shared her concerns in a public Feb. 26 post and suggested followers call Gloria’s office. Within hours, Denise Marie had also posted her video call to action, and dozens more shared it. Some of their posts spread widely, too. Fetzer told VOSD she was particularly alarmed after watching a Jan. 25 press conference where County Supervisor Nathan Fletcher, a former state assemblyman who is married to Gonzalez, referenced discussions about potential mass vaccinations during the 2009 swine flu pandemic while answering a reporter’s question about AB 262. “I don’t think it’s a huge stretch to think vaccines could be included in the powers that are given to the local health authority,” said Fetzer, who has since talked to a Gloria staffer about the bill. Christina Hildebrand of A Voice For Choice, a group that argues vaccines are linked to autism – a claim that the CDC has expressly shot down – said her organization has separately reached out to Gloria’s office to urge updates and submitted proposed amendment language. “When you have a such a broad piece of legislation giving broad authority, we’re really just concerned that that can be overreach,” Hildebrand told VOSD. Hildebrand’s group also came out against SB 277, co-written by Gonzalez and signed by then-Gov. Jerry Brown in 2015, which required that any child enrolled in public or private school as well as daycare to be vaccinated against 10 diseases. A Voice For Choice unsuccessfully challenged the constitutionality of SB 277 in court. Both Hildebrand and Fetzer said Gloria’s office has thus far been willing to discuss their concerns about AB 262. Serrano confirmed that Gloria’s office is considering tweaks but has not committed to changes. “We will appropriately consider these amendments and hopefully work to find some common ground but (Gloria’s) been clear about what his intent is with this legislation and we’re gonna stay true to that,” Serrano said. The assemblyman’s goal, Serrano said, is to empower health officers during outbreaks and promote public health. Clarification: This post has been updated to reflect the fact that SB 277 required vaccinations for children attending private school and daycare in addition to public schools.